Facebook-sharing is caring - Chocolate Chocolate and More! I love Facebook! Before I was ever a blogger, I was a facebook junky. I love seeing what everyone’s up to and it’s allowed me to keep tabs on friends and family that, well, I probably wouldn’t just pick up the phone to call on a regular basis. As a blogger, Facebook is an invaluable resource for me. And it’s FREE. Hopefully you’re reading my tips and finding a few things you can do to make facebook work for you. I wrote about setting up your page and sharing your photos here. Before we move on to Sharing, I just want to restate when you share your posts-SHARE A PHOTO! I did a test, just to verify what I already knew. I shared a link of my Homemade Nutella-just the link with a nice little comment. Woohoo, 16 people liked it and it was shared by someone one time. I posted this at my prime time-7:30pm. I scrolled back to when I posted this same post but as a photo with a link in the comments. Do you see how many likes it got? 133 people liked it. But whats even better is this photo was shared 114 times!!! And this photo isn’t even that great, it was rejected by all the photo sites, but that’s another post. So now that I’ve convinced you to share photos, it’s time to talk about sharing. Not your posts but other stuff. The cute picture of a puppy, the funny saying, another page’s post. Reminder, this is what works for me, so don’t shoot me. Take the position of your reader. Why did they come to like your page in the first place? Probably because of the delicious food you post. (or whatever your blog is about) After liking a zillion other pages to make sure they’d come “like” me back, I now had a wall full of posts. I love when my food friends share more food. It’s how I get ideas, find more friends and when I go visit, I know that we have something in common. Sharing things on your page just to fill space will annoy your readers. Sharing things on your page that have no relevance to what your page is about will annoy your readers. I’m a food blog, so if I start sharing photos about dinosaurs, I’m going to annoy my readers, and after a while they will probably start to “unlike” me. Decide what you are about and stick with it. I’m a sweet, nothing healthy about me, food blog. So guess what I try to share with my readers. Sweet, yummy treats! That’s what my readers expect. This doesn’t mean don’t ever share the cute photo of your kids on the first day of school, just don’t make it an everyday habit unless you blog about kids. This also doesn’t mean you shouldn’t share the cute sayings. Just know that it’s what the readers will learn to expect from you. When I share on Facebook I try to share photos that will either take the reader to my blog or to someone else’s blog. There is so much good stuff out there, I don’t need to use “filler” to clog up my wall and my reader’s. In your comments tag the page you got it from (to tag on facebook, use the @ sign then with no spaces type in the page name, @the cooking actress) say something nice and hit the share button. Also when I share I leave a comment on the original post “this is so yummy I just have to share” or something like that. I honestly love this Cinnamon Streusel Coffee Cake from the Cooking Actress so I’m pretty sure my readers will too. And Kayla put the link to her post in her comments so my readers can either go to her facebook page (because I tagged her) or go straight to the coffee cake post. Win, win. These used to be great when we could see who “tagged” us. But honestly, I don’t think most fans took the time to go like all my friends. Those likes and comments were from the pages I tagged. I’m kinda glad facebook took the tagging notification away from us. It has cut down on these type of posts. If you want me to like someone’s page, show me why I should. Share a photo from the page with a tag and nice comment in the caption. Here’s why you should share other pages yummy stuff. We can still see who is sharing from our pages. And we check it, at least I do. And if you’re a nice person, you’ll probably return the favor. Pay it forward, Share it first! Remember that Nutella up above? My Imperfect Kitchen shared it and 20 more people shared it from her post! Now I do occasionally do a mini shout out but hopefully my readers don’t get annoyed by it. I disguise it. Don’t cut out the middle man you found the post from. There’s a trend on facebook, having a party on your page. There’s usually a theme. Above, you see Mom, What’s for Dinner? was having a dessert party. Everyone heads over to her page and shares a dessert photo with the link and then Mom will share the posts with her fans. Big win for all of us going to the party. But pay it back. Don’t just post and run. If it’s good enough for you to share to them, then share it back. I try to find something posted by someone else at the party and share it with my fans, tagging both the host of the party and the owner of what I’m sharing. In this case it was The Fountain Avenue Kitchen‘s Blueberry Crisp. Facebook Parties can be huge for both the host and the attendees. But they are a ton of work for the host. Sumptuous Spoonfuls Did an A-Z challenge about a month ago. Each Day she would take the letter of the day, choose an ingredient, give the health benefits of it then invite everyone to share their appropriate photos and links on her page. She then shared them with all her readers. Any time I was able to participate, my likes would go nuts. I’ll never be able to pay Ann back for all the good she brought to me but any time I can share something of hers, that I know my readers will like, I try to. I loved this Chocolate Oatmeal she posted for Xocolatl (Chocolate.) Ann’s starting a new party series on Facebook. Fit and Fun Fridays. I can’t wait to see everything that gets shared from that party! I say this about blogging and I’ll say it about facebook. Your readers have already found you! Share the love and help them find others through sharing on facebook, links on your blog posts. It will come back to you eventually. Just like growing your blog takes time, so does developing social media. It won’t happen over night but it will happen. And the more your Facebook page grows, the more people will see your photo with a link, from your blog, and click over to read more. Think quality not quantity. Remember to keep your readers in mind. After all, I’m a blogger but I’m also a reader, aren’t you? How do you use Facebook? You can find my posts on Pinterest here- How I use Pinterest and How I Pin. Next week, we’ll start on Twitter and since I’m such a twit that I don’t know how to Tweet, I’ve asked my friend Carla from Chocolate Moosey to hold our hands in the land of Twitter. Also, in case you haven’t heard, I finally found the perfect blogging conference. Online Blogcon. No travel, only $15.00 for the entire conference and they’re doing a giveaway for a Kindle Fire! I’m even going to buy new pajamas for the conference, maybe slippers too. Want to look my best while attending the conference! Cherry, so glad I could help. When you’re ready to pop over to the Facebook world, just start slow. It takes time but it can be so rewarding, just like blogging. This is a wonderful post, wow, you are amazing sharing all of this incredible information! I learned so much, wish I had this a year ago, LOL! Love you Joan! Awww Dor, love and hugs right back at ya! I know I wouldn’t be anything with out the support of my wonderful friends! Gotta share what I love! So glad I can help others with these posts! Such great tips, Joan! Thanks for sharing your FB knowledge with us all :). I am so excited that I found this post. I was wondering about sharing other people’s pictures on Facebook. Some people said that you should only share photos that are your own because of Copyright issues. I think I will try this today by tagging the page of the photo owner that way they get credit. Thanks! Tulip, hitting the share button below someones photo on Facebook is the easiest way to share anything on facebook. Then there’s never any doubt that it’s ok to share. 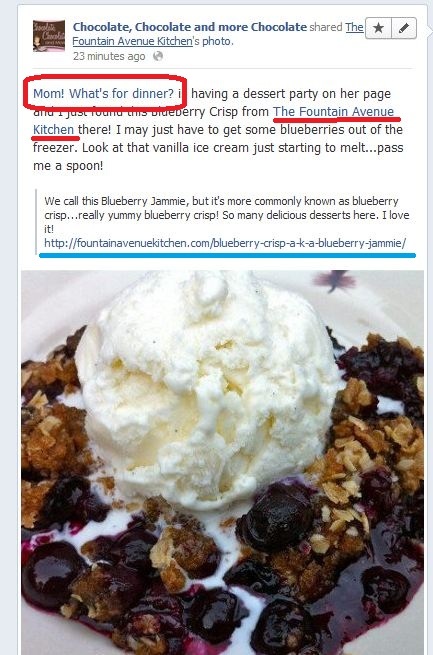 Facebook will automatically tag the photo with the owner like it shows above the blueberry crisp photo here. I would never recommend saving a photo from facebook (or anywhere else on the internet) to your computer and then uploading it to facebook like it belongs to you. The work does belong to someone else and they deserve the credit. There are sites out there YoureCards is one, where I think you can create cute sayings that you can share. But honestly, there is so much already out there and sharing is a great way to make new friends when you do it the right way. Anyway, thank you so much! You’ll be hearing more from me! Christy, just be patient and don’t, don’t compare your page to others. Share what you love, give credit and the likes will come. Also if someone makes a comment on something you post, be sure to reply with their name tagged. They’ll see you responded and become a loyal follower. Jamie, there is so much out there in social media, I know I’ll never figure it all out, lol. Just glad I can share the little I’ve figured out. Love this post! Such great insight (especially for all of us newbies) Btw, I found you thru Nettie’s share (exactly the point, right?!) Off to share on our fb page! This is a well-written, thoughtful and helpful post, Joan. Thank you very much for mentioning The Fountain Avenue Kitchen. As a fellow twit, I am so glad to know that I can check back in next week and finally figure out the world of Twitter! You’re the best! Thanks Ann, I can’t wait for the twitter post either! Great post! 🙂 I’m a Facebook junkie too, it’s hard for me to break away and remember that there ARE other social media outlets. Thank you..a fantastic article, an interesting read and some good pointers! Lots to learn for sure! Thanks Sue, I think we’ll always be learning new things with facebook! Fabulous post! Informative, beautifully written and your warmth and sense of humor shines through. Thank you Carol. Food people are truly some of the best people I know. Hugs! Jana, I hope some of these tips help. I can’t wait for the twitter post. I have an account but no clue on what to do there. We’ll learn together. Love this! I’ve really been trying to increase interaction with my readers on Facebook…and get them to our site too…I’m gonna start posting photos instead of just links to new posts. I already share lots of other bloggers posts if I think my readers will like them. Very good article. Sure this would help a lot of beginners. earlier I too used to just share the links but sharing the photos have made a tremendous difference. Great article! I’ve been following all your educational posts – well I just read everything you post – but these have been particularly helpful! I love it when you share other posters recipes etc… I trust your judgment and have always found great bloggers. That homemade nutella – I shared it AND pinned it where it was repinned a ton!! Love your stuff – ALL of it! Oh My Gosh! I am so glad I clicked on the delicious looking chocolate cake at Natasha In Oz Party. I was just sitting here wondering how to start a Facebook, where do I go to Pin and how to pin, do I need to twitter. To be honest this how I get overwhelmed and think “Do I really have anything worth sharing and who really cares about it?? Well, I am going to follow you and look forward to getting more info from you. I’m loving that cake and this post! I will be perusing more through your blog… itching to learn the ins and outs of growing my blog even more. My big blog redesign (launching Friday!) is step one, but you touched on a few things here that I need to address. Thanks. I hope you wrote this post thinking about me! I’m so clumsy when it comes to Facebook and have been meaning to write you an email about it for a while now (probably I’ll end up doing so anyhow) but just wanted to say THANK YOU! for this wonderful post! I’m going to have to bookmark this page and read it again when I have more time to digest it all! I’m not a facebook fan at all and only just joined up this year. I am still learning how to use it so really appreciate your tips! Thanks for linking this post up to my Say G’Day Saturday Party. I will share it on Facebook right now! GREAT pot…ah, no, poSt. I’m functioning on 3 hours sleep here. Wow! Great tips! I never thought about the sharing the picture instead of just the link thing. Thank you, thanks you! Great tips! Soo glad you are joining us at Online BlogCon!! Can’t wait! This is amazing info! I have already posted one of my blog posts as a picture with the link in the description, like you said to do and WHOA – that picture is huge 🙂 I have also started sharing other blogs posts. I love the pay it forward concept and I’m all for giving others shout outs. I’m sometimes just a little slow because I post to SOOOOO many different social medias. These are great tips! I also notice the difference between adding a pic and just the link! Thanks for joining the party at Keep Calm and Link Up! Awesome tips! Thanks for sharing, Joan! Thanks so much for this .. it’s so helpful! I have a question though about Facebook. I’ve recently set up a page for my blog and I’ve just noticed that only ‘likes’ from people’s personal pages show up on my page. Likes from other food bloggers’ pages don’t seem to be counted. Am I doing something wrong or is this just how it is? For your “likes” number, only personal page likes count. Facebook is always changing things up so just keep posting good content (with a gorgeous photo) and the followers will come.